August 21, 2018 August 21, 2018 by Wm. B. Eerdmans Publishing Co.
Klyne R. Snodgrass is professor emeritus of New Testament at North Park Theological Seminary in Chicago. He is the author of multiple books including Who God Says You Are, recently published by Eerdmans. When doing research for a book and writing it, one has no idea how it will be received, especially when it is a large book. The reception of Stories with Intent exceeds anything I might have thought. Sign up for Eerdmans Commentary Club and save up to 50% on our newest commentaries. 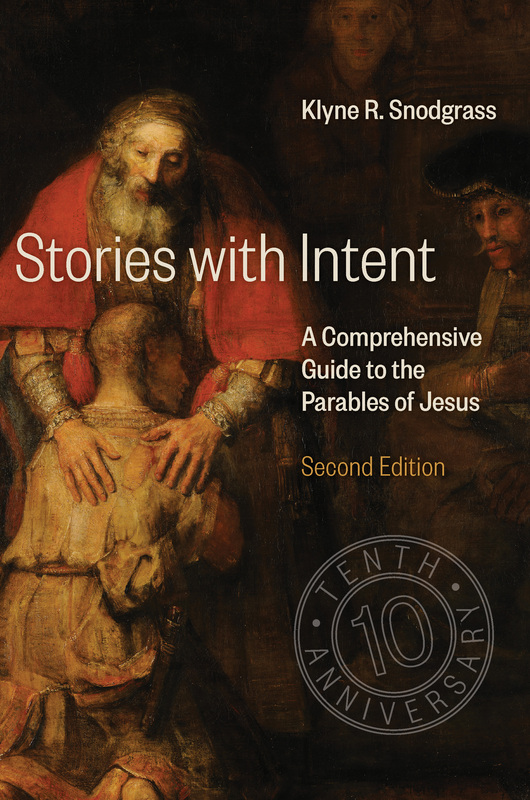 Use code CC0318 to save 40% and receive free shipping on Stories with Intent at Eerdmans.com. I tried to make the book accessible, and it must be, for people at various levels have found the book useful. Parable specialists have discussed the book at professional meetings. Universities, colleges, and seminaries of various types and traditions have used the book as a text for classes on parables. In 2009 Christianity Today recognized Stories with Intent as the Book of the Year in biblical studies. In 2009 Christianity Today recognized Stories with Intent as the book of the year in biblical studies. I never even considered that the book might be translated, especially given its length, but people invested significant time to translate the book into Portuguese, Chinese, Spanish, and Russian. Scholars, pastors, and students report that they find the book valuable in their work. That pastors frequently use some aspect from the book when preaching on parables is a wonderful affirmation of the work. An author could want nothing more than that people wrestle with the ideas in the book. Why is this book important? Primarily it is a protest against the misuse of Jesus’ parables. In my mind it provides the focus and the resources for readers to understand what is crucial with regard to parable hermeneutics, what is happening in the way people approach Jesus’ parables, the first century cultural dynamics the parables presuppose, the theological use of the parables by the Evangelists, and especially what Jesus was doing with the parables. Jesus’ parables are vulnerable to abuse on all sides by both academics and pastors. His parables are too easily torn from his purpose and used, sometimes with great erudition, for whatever purpose an interpreter has. Stories with Intent seeks to force people to do justice to the parables in terms of Jesus’ purpose. His intent was to challenge and transform his listeners. Jesus’ parables are as engaging and forceful as any literature, and they deserve to be heard as Jesus intended, and no, that is not an impossible task. I did not anticipate a second edition of Stories with Intent, but James Ernest, editor-in-chief at Eerdmans, suggested the book deserved an update chapter and to be reissued. With the update chapter I have surveyed about twenty-five books that have appeared in the last decade. The issues and tendencies remain largely the same. In contrast to Adolph Jülicher’s limiting parables to one point, people regularly see multiple points between image and reality and know this has nothing to do with allegorizing. Other questions continue to be discussed. What is a parable? Can Jesus’ purpose be determined? How much and what kind of “background” information does one bring into interpretation? How does one interpret parables, and how open to meaning beyond Jesus’ intent are his parables? Are they really polyvalent? Are they mysterious or fairly clear? I argue most are not mysterious, that they are not polyvalent, and that Jesus’ intent is both clear and compelling. My hope for this second edition is that Stories with Intent will continue to provide direction and insight and will engender conversation about the most important storyteller ever and his stories. Purchase Stories with Intent on Eerdmans.com, Christianbook.com, or at your local independent bookstore.